Dynamic method dispatch is a mechanism by which a call to an overridden method is resolved at runtime. This is how java implements runtime polymorphism. When an overridden method is called by a reference, java determines which version of that method to execute based on the type of object it refer to. In simple words the type of object which it referred determines which version of overridden method will be called. Notice the last output. This is because of gm = ck; Now gm.type() will call Cricket version of type method. Because here gm refers to cricket object. Q. Difference between Static binding and Dynamic binding in java ? Static binding in Java occurs during compile time while dynamic binding occurs during runtime. 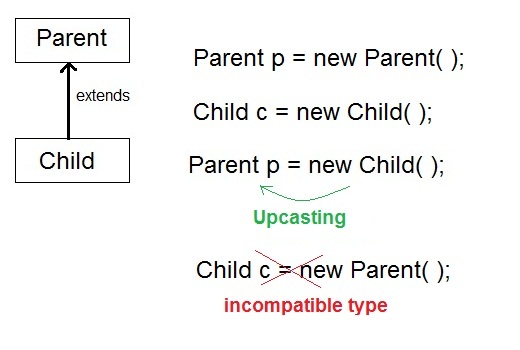 Static binding uses type(Class) information for binding while dynamic binding uses instance of class(Object) to resolve calling of method at run-time. Overloaded methods are bonded using static binding while overridden methods are bonded using dynamic binding at runtime.